"Wick structures can be difficult to keep clean or intact over long periods of time. The problem is especially acute for applications, such as NASA's Journey to Mars mission, that put a premium on reliability and minimal maintenance," said Professor Joel Plawsky, who heads the Isermann Department of Chemical and Biological Engineering at Rensselaer. Working with a NASA engineering team, the researchers are conducting CVB experiments at the International Space Station. Plawsky and postdoctoral research fellow Thao Nguyen recently wrote an article about the CVB project in Physics Today, published by the American Institute of Physics (AIP). "The CVB project is designed to record, for the first time, the complete distribution of vapor and liquid in a heat pipe operating in microgravity. The results could lead to the development of more efficient cooling systems in microelectronics on Earth and in space," Plawsky said. A heat pipe is partially filled with a working fluid, such as water, and then sealed. At the heat source, or evaporator, the liquid absorbs heat and vaporizes. 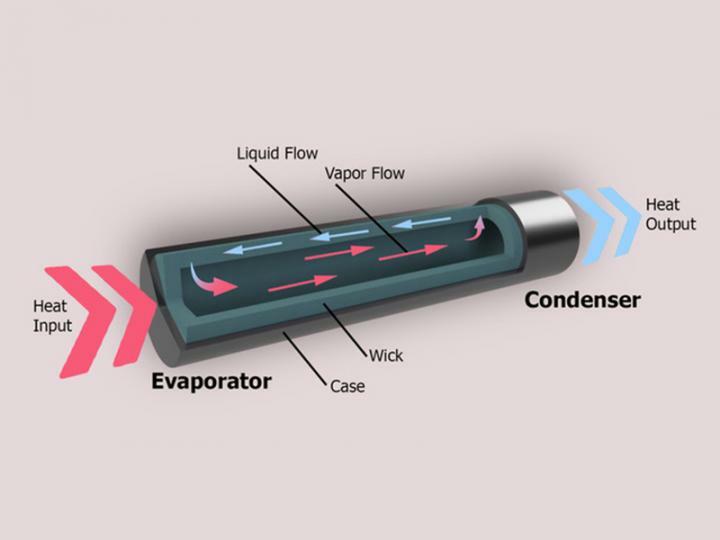 The vapor travels along the heat pipe to the condenser, re-liquifies and releases its latent heat, eventually returning to the evaporator, without any moving parts. In the CVB experiment, Plawsky's team created a miniature heat pipe, using pentane (an organic liquid) in a glass cuvette with square corners. An electrical resistance heater was attached to the evaporator end. At the other end, a set of thermoelectric coolers kept the condenser temperature fixed. The transparent tube allowed the researchers to study the fluid dynamics in detail, and the sharp corners of the cuvette replaced the job of the wick. Two main forces affect how a heat pipe performs: capillary and Marangoni forces. The capillary force is what drives the liquid back toward the evaporator. This is the same force that causes liquid to climb up a straw. The Marangoni force arises from a change in the fluid's surface tension with temperature. This force opposes the capillary force and drives liquid from the evaporator to the condenser. When the amount of liquid evaporating is larger than what can be pumped back by the capillary force, the evaporator end of the heat pipe begins to dry out. This "capillary limit" is the most common performance limitation of a heat pipe. The researchers expected the same thing to happen in the CVB experiment. But, instead, the evaporator flooded with the liquid. That's because the Marangoni and capillary forces were no longer fighting against gravity. As a result, the Marangoni force overpowered the capillary force, causing condensation at the evaporator end. However, the net effect was the same as if the heat pipe had dried up. "As the flooded region grew, the pipe did a poorer job of evaporating liquid, just as would happen if the heater were drying out," Plawsky said. The researchers have countered this problem in the next stage of the CVB project by adding a small amount of isohexane to the pentane. Isohexane boils at a higher temperature and has a higher surface tension. This change in surface tension cancels out the temperature-driven Marangoni force, restoring the heat pipe's performance. "The School of Engineering at Rensselaer and NASA have had long-standing and productive collaborations on a number of important research projects," said Dean of Engineering Shekhar Garde. "Dr. Plawsky's heat-pipe research is a great example of our work with NASA to help translate fundamental understanding of liquids into real-world applications here on Earth and in space."